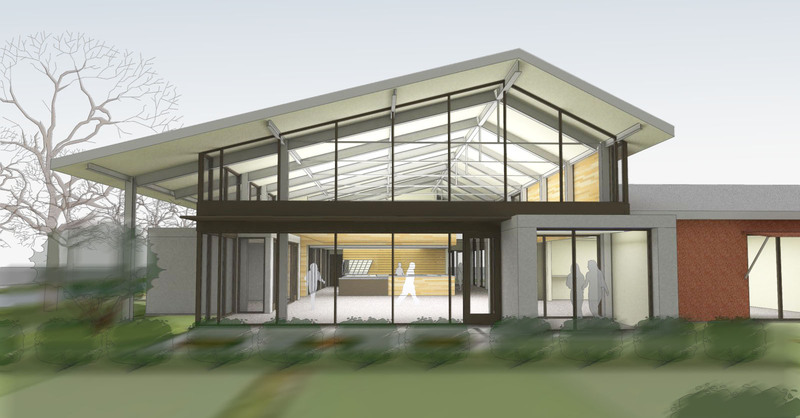 The Willits Center, designed by TLCD Architecture, will be a 6,700 square-feet classroom and administrative building on a 4.1-acre site located east of downtown Willits. The heart of the building design will be the Learning Center, a large, day lit space for students to study and collaborate. An operable sliding storefront wall will open the Learning Center to an adjacent computer classroom, and two large sliding barn doors will open the front desk to the Learning Center. The exterior will include weathering steel panels, fiber-cement panels, and glass, while the interior will feature reclaimed redwood paneling and polished concrete floors. This building should be a real gem for the community of Willits and will help the College meet its goal of providing students with a convenient and collaborative educational environment for the students and residents of North Mendocino County. At the August 2nd meeting of the Mendocino-Lake Community College District Board of Trustees, the construction contract for the Willits Center was awarded to Midstate Construction of Petaluma. There were a total of 9 bids received, and the 3 low bidders were all under the engineer’s estimate of $4 million. Mobilization of the jobsite should begin soon and the construction duration is set for 10 months. ← When is a Green Roof not Green?